This week for the Mom Explores Book Club we read “Falling for Rapunzel” by Leah Wilcox. In this story Rapunzel has a hard time hearing the prince when he requests her let down her long hair, and ends up throwing down quite a few things, none of them being her hair! It’s a funny book, I recommend it for any silly little ones! One of the things that struck me from this book was the rhyming component. For example, he asks for her locks, and she throws down her socks. My son is starting to recognize rhyming words, so it seemed like a great time to utilize this story as a teaching opportunity and expand on this topic with him. 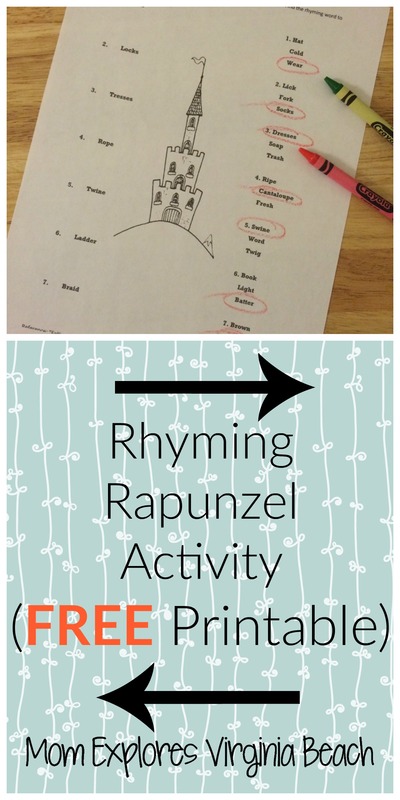 I decided to make this activity double as a reading comprehension activity as well, by using the items she actually threw from the tower in the book. 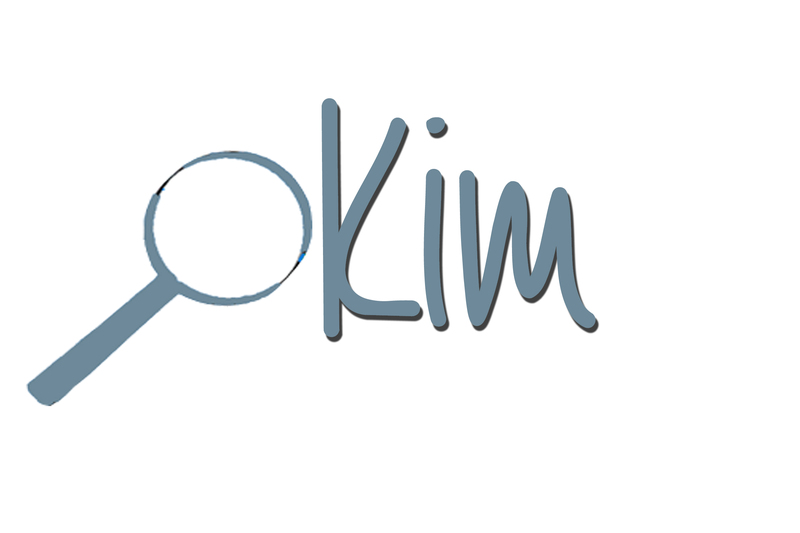 Students will have to identify the rhyming word from three given word choices. Best of all? It’s a free download. Click below, print, and get rhyming! We did this orally together, as my little one isn’t reading yet. Some words may be more challenging for youngsters who are reading to decipher on their own, so be sure to sit with them and help if needed. 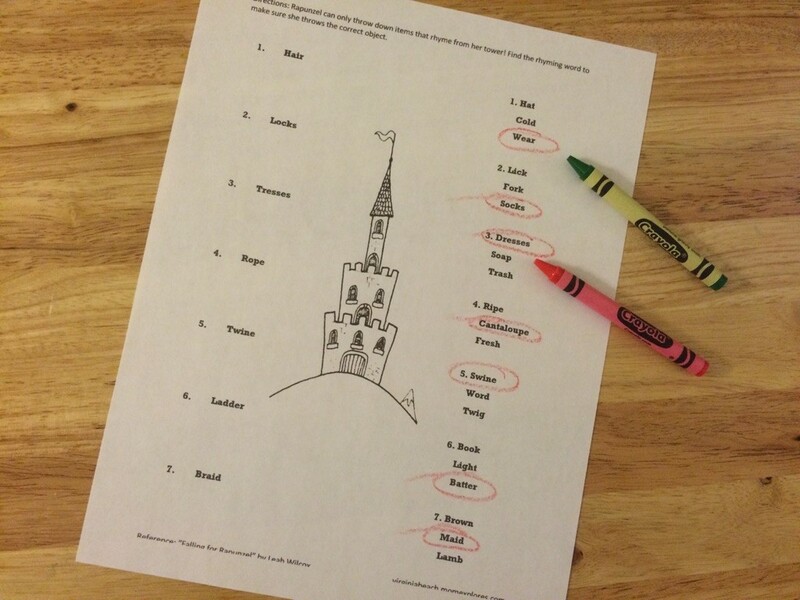 Bonus: There’s a castle with a tall tower pictured in black and white in the middle of the worksheet. Doesn’t sound like much I know, but coloring is a great bonus for kids to be creative and work on their motor skills! So let them color after they’re done rhyming! Check out what the other moms have created for this week’s book club.